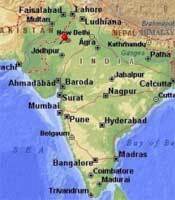 SKSN is situated in the rural depths of Western Rajasthan, and on the fringes of the great Thar Desert. 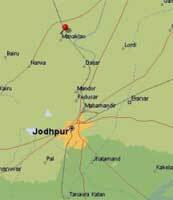 The school is located 28 kms from Jodhpur, a place known as the 'blue' city of this bone-dry, yet majestic state. Jodhpur is the second-largest city in Rajasthan. 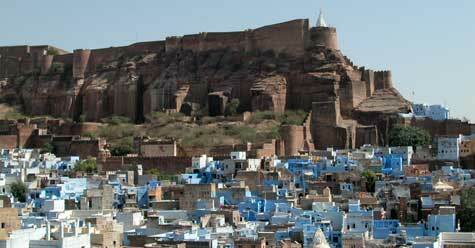 The massive Meheranghar Fort dominates the city, overlooking the brilliant blue buildings of the old city. Rajasthan has a beautiful, yet hostile terrain. Records show that over the last hundred years, seventy of them were plagued with a scarcity of monsoon rains leading to severe droughts and famines. While most of India enjoys an annual monsoon period, this arid zone of Rajasthan has to contend with the monsoon rains gracing it with their presence only once every three to four years - a regular pattern in this part of the world. Due to the lack of these seasonal rains in the area, it results in an acute shortage of water. And the victims of this catastrophic weather cycle are generally people who belong to the poor strata of society. In particular, it affects the people living below the poverty line, including the Scheduled Caste and Scheduled Tribe, classes. 80% of the villagers are dependent on agriculture for their livelihoods. But since this desert region is essentially un-irrigated, farming can only be carried out once a year - in the months of July, August and September, should the monsoon rains decide to descend on the area. The climactic and environmental elements are greatly responsible for the fate that has been mapped out for the people living in this part of the world. 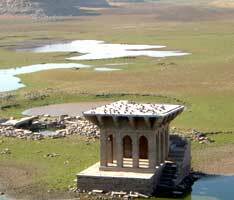 Bal Samand - the waters in this lake rise three to four feet above the roof of the temple when monsoons are kind to its people by finally bringing sufficient rain their way.